Shanghai, China, March 16, 2016 /ChinaNewswire.com/ - Despite the fact that singing as an art occurred virtually at the same time as civilization appeared, rather few people can sing well. 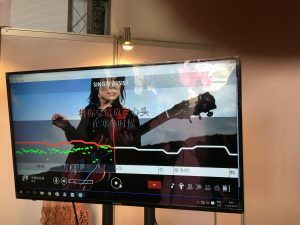 And now, only this innovative technology called Sing Assist can significantly improve the quality of song performances in karaoke, even if the performer has no talent or ear for music. We can represent singing as a mathematical model by decomposing the contour into certain parameters. Each track in karaoke has its own contour and the Sing Assist singing technology adjusts the performer's vocals to it. The output singing (the synthesized voice) is automatically modified to match the required octave, pitch, and tune. The singing processor made by Sing Assist's developer IT4YOU processes the source vocal data to match each standalone pitch. To avoid appearance of defects during the enhanced singing synthesis, the hardware part of the product smooths the song music on the temporal scale. Due to this, the performer’s voice remains natural. When combining (mixing) the synthesized voice and the music, the software uses the voice technology patented by the developer, due to which it is possible to achieve guaranteed enhancement of the singing performance of the singer even in case of complex voice quality (defects of the speech path). The revolutionary technology is represented in the quality of the software, which is supported even by ordinary PCs, as well as mobile devices based on Android and iOS platforms. Anyone who has been shy of their vocal performance in karaoke can now sing now as a professional. The software features a dedicated social networking community, as well as support of social media on which performers can share their records, create albums, get comments, evaluate other singers, and do a lot of other things. The singing processor can be widely used in karaoke bars for enhancement of performers' singing and application of professional effects (echo, fading, reverberation, choir, etc.) without involving a sound engineer. This will not only allow singers to overcome the psychological discomfort, but also allow guests really enjoy pleasant performance of songs. The advantage of the technology resides in the real-time voice smoothing. Also, the developer has implemented the solution that allows to avoid training the system before using it, due to which users can sing immediately after they have selected a song. Find the booth number 20 of IT4YOU, the software developer, at the ICASSP 2016 Exhibition and evaluate the breakthrough in the world of singing technologies. Do not miss the technology presentation that is about to revolutionize the karaoke world.